Val Gardena is centred on the resort of Selva and nearby Santa Cristina and Ortisei. Lift-linked to the Sella Ronda, the local skiing is some of the most exciting in the region, with famous runs including Ciampinoi, Dantercepies and Piz Sella. Annual World Cup Downhill event recorded Britain's best ever performance - a second for Konrad Bartelski. The neighbouring resorts of Santa Cristina and Ortisei together make up the Val Gardena area. Ortesei is a elatively large and pleasant market town with a double cable-car link to Santa Cristina and Selva and from there onto the Sella Ronda, time and snow permitting. The town has a life beyond skiing, being a regional agricultural and commercial centre. it is therefore a good choice for those who like to escape ski talk in the evenings. Santa Cristina is a spread out but attractive village. When will it snow in Val Gardena? The next notable snow forecast for Val Gardena is 2cm1in, expected on 19 April, with around 8cm3in forecast over the next 7 days. How High is Val Gardena? The Italian Ski Resort of Val Gardena is part of the Dolomiti Superski area with access to 1,420km882 miles of downhill skiing, with 668 marked pistes, served by a total of 488 ski lifts. In addition to the skiing in Val Gardena itself (176km109 miles of pisted ski runs), the appropriate ski Lift Pass will allow you to ski or snowboard in the other Dolomiti Superski ski resorts of Alpe di Siusi/Seiser Alm, Alta Badia, Alta Pusteria, Arabba, Bruneck-Kronplatz, Civetta, Cortina d`Ampezzo, Marmolada, Obereggen, Predazzo, San Martino di Castrozza, San Vito di Cadore, Val di Fassa, Val di Fiemme and Valle Isarco. With ski lifts as high as 2,518m8,261ft, skiing and snowboarding is assured throughout the season. In skiing terms Selva Gardena is the best known of the three villages in the Gardena Valley which now market themselves together as Val Gardena. Indeed Selva's official title is currently 'Selva Gardena' although in common with most villages in the formerly Austrian and strongly Germanic South Tyrol area of northern Italy, it also has a German name 'Wolkenstein', although this is rarely used (except in marketing to Germanic nations). At least adding Gardena to Selva (Or 'Gröden' rather than Gardena for German speakers) prevents any mix up with fellow Dolomiti Superski resort Selva di Cadore, and the more remote danger of another mistaken identity case with Prata Selva in more distant Abruzzo. Confused? Well the locals must be quite blasé about it as they have a third language dating back several millennia to when the Roman legions marched in to the area and their Latin got mixed up with the native 'Rhaetian'. Selva is the best placed of the three Val Gardena resorts for most skiers, at the head of the valley which leads up to a Pass which can take you down to the Fassa Valley on one side and to Alta Badia on the other. The really excellent thing, as far as skiers are concerned, is that you can ski in both directions and continue right round the huge Sella mountain on the famous Sella Ronda circuit without having to take your skis off or go back on yourself. Better still, because Selva is part of the world's largest ski pass system, the Dolomiti Superski, you have computer card access to all the lifts on that route (and hundreds more that you can drive to). Val Gardena put itself on the map in modern times by staging the Alpine Ski World Championships in 1970, but it was already long famous as one of the early classic centres for skiing. Tourism began in the valley, which had three centuries of fame for its wood carvings, around 1860, firstly with summer visitors - nature lovers and more adventurous mountaineers. Then came the first tentative stirrings of what quickly became a key sector in Val Gardena - tourism. The winter sports took a hold at the turn of the twentieth century and in 1908 the first ski club (Ladinia) was founded in Val Gardena. The first ski race was organized in the same year (from Passo Gardena down the steep Dantercëpies Valley to Selva). Apart from some great skiers and wood carvers, the Val Gardena is famous for producing a famous musician, Electronic music pioneer Giorgio Moroder who has collaborated with many famous artists including Phil Oakey, Donna Summer and Debbie Harry on global hits. The area is also beloved by British tourists partly because in an annual World Cup Downhill event Britain recorded what is still its best ever performance - a second for Konrad Bartelski. Selva is a complete, lively and rather cosmopolitan resort in the tradition of the classic Italian resorts such as Madonna di Campiglio and Cortina. The proximity of, and integrated promotion provided by the other Gardena Valley resorts, smaller Santa Cristina and the largest village, Ortisei (known as St Ulrich to German speakers), only add to what's available. From there it's possible to pass through a tunnel back across the village and reach Alpe di Siusi's lifts, an area especially famous for its cross country. The remarkable Ronda Express opened for the 2004-5 season, an undergreound railway system linking all the Val Gardena ski areas without the need to take a car or a bus. Until 1960 the valley was accessible by train from Chiusa, and although trains only ascended the often steep gradients at 10-15mph tourists continues to prefer the spectacular scenic route to the version by road in the valley below, even when the latter were improved. Sadly all that remains of the railway now is a steam locomotive permanently parked in Ortisei. However the views from the villages themselves of the stunning pink Dolomitic precipices above the lower wooded valley slopes remain as spectacular as they have always been. The longest possible descent in Val Gardena is 9km6 miles long and the most difficult run is the 'Nogler'. Val Gardena is a great skiing centre with particularly appeal to those who enjoy the sensation of skiing from village to village with the unique Sella Ronda joining Canazei, Campitello, Corvara, Colfosco and Arabba like a giant wheel, with valley 'spokes' coming off linking more resorts in the Fassa Valley, Alta Badia and others. If you travel the other way down Val Gardena you can reach half a dozen other major ski areas within a few minutes drive. Because the terrain is dominated by spectacular pink precipices most of the skiing has to take place either on the gentle lower valley sides or through short sharp descents cut out between the precipices. These tough runs are rather few and far between in the dolomites, on piste at least (It's a mecca for off piste with guiding), but Val Gardena does have more than its fair share of tough skiing, one of the reasons that the World Cup keeps coming back. Beginners can take advantage of Selva's relatively high altitude for a traditional village (1563m/5115 feet) and its extensive local snow making and make their first turns on the gentle meadows along side the village. Intermediates will probably enjoy the whole huge area the most - with 175km (110miles) of lift-linked terrain linking more than a dozen villages in the area, there are few if any pistes runs that a good intermediate can't tackle, even the famous runs including Ciampinoi, Dantercepies and Piz Sella beloved of experts. For the experts, besides the aforementioned runs on the piste and notwithstanding the fact that there is six times as much skiing on your Dolomiti Superski Pass to explore as there is in the already huge lift linked area, it must be pointed out that ski mountaineering in the Dolomites is something very special. The choice of routes is varied, but most offer a combination of unique views, relatively short ascents (sometimes with a little help from a lift), and downhill runs through demanding terrain, with narrow gullies and steep gaps. Itineraries include the ski tour from Forcella del Pordoi - Val Mezdì - Val Lasties: a famous downhill route - and rightly so - but not always easy. The route starts at the top of the Pordoi cableway. Then there's the Marmolada glacier or the high-alpine downhill run from Forcella del Sassolungo (2,686 m) through the Langkofelkar to Monte Pana. Finally the Val Gardena also has plenty to offer cross-country skiers. From Selva Gardena, Vallunga provides a magnificent backcloth for cross-country skiing. A total of 15 km of trails lead from the Carabinieri Sports Centre to the end of the valley. There is a cross-country Ski School and a ski hire at the start of the trail. Nearby Alpe di Siusi is a real paradise for the more ambitious cross-country skier, with over 60 km of prepared trails and superb views at every turn. Selva Gardena is a major 'boarding centre. It has a terrain park and regularly hosts competitions. It is one of still comparatively few Italian centres to take the trouble to build terrain features. Most of the terrain can be accessed by chair lift, gondola or cable car and it's possible to do most of the Sella Ronda circuit avoiding drags, however the terrain is often very gentle so you'll be lucky to avoid flats - seek local advice! The local ski school and rental shops cater for 'boarders although as yet there's no 'boarder only outfits. There's plenty of lively nightlife in Selva too. When is Val Gardena open? We don't currently have confirmed season dates for Val Gardena. NOTE:- Lift and Piste openings are always subject to Snow Conditions in Val Gardena. Val Gardena is able to make snow, on 165km103 miles of ski runs,. The 84 ski lifts of Val Gardena are able to uplift 115,553 skiers and snowboarders every hour. Val Gardena is in the Italian Dolomites in Sëlva, South Tyrol, Italy. The nearest airports to Val Gardena are Bolzano, Innsbruck Airport and Verona. There are eight airports within three hours drive. Bolzano is just one hours drive away, in good driving conditions, so you can be on the piste quickly. The Webcams in Val Gardena are not always up-to-date. Please check the date on the image to ensure you are seeing current snow conditions. Selva Gardena is one of the livelier resorts in Europe, with a good choice of bars and night spots. The local facilities are generally doubled, sometimes trebled, by the proximity of more venues in neighbouring Santa Cristina and Ortisei. Selva can also offer many quieter, atmospheric bars where you can relax with s a good glass of beer, or an adventurous cocktail, perhaps the local drink, Willy, with pear brandy or vodka with figs. The Bar La Stua has live music twice a week. La Bula also has a live music with a DJ straight after the lifts close. The Luislkeller remains open to 1 am. Other good choices are the Igloo, Kronestube and Heustadl - Disco. For dancing to 3am there are three choices in each of Ortisei and Selva, with the latter's Dali-Disco Dance is especially popular. Want to Know when it Snows in Val Gardena? 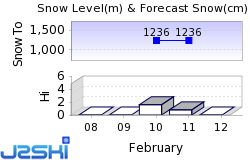 Click above to get Snow Reports by e-Mail for Val Gardena. By doing so, you agree to Our Rules. Other Ski Areas within Dolomiti Superski. Other popular Ski Areas near Val Gardena. Common questions about Val Gardena. For current snow conditions, see our Val Gardena Snow Report. Want to ask about skiing and snowboarding in Val Gardena? Or contact Val Gardena Tourist Office. Note :- The information on J2Ski concerning Val Gardena, where not clearly factual, is opinion only and is neither definitive or exhaustive. Warning :- Snow Sports are Dangerous! Skiing, snowboarding and all winter sports involve risk of serious injury or death. You MUST confirm all information, especially snow and weather conditions, in Val Gardena before you ski or board. You participate at your own risk.